Despite the crowds, there’s something truly satisfying about skiing in bounds. Maybe it’s the fact that you can accomplish thousands of feet in a day, or just the convenience of a warm lodge nearby to thaw cold hands and feet. But when you’re out of the habit, the sheer number of important items to pack can be intimidating. 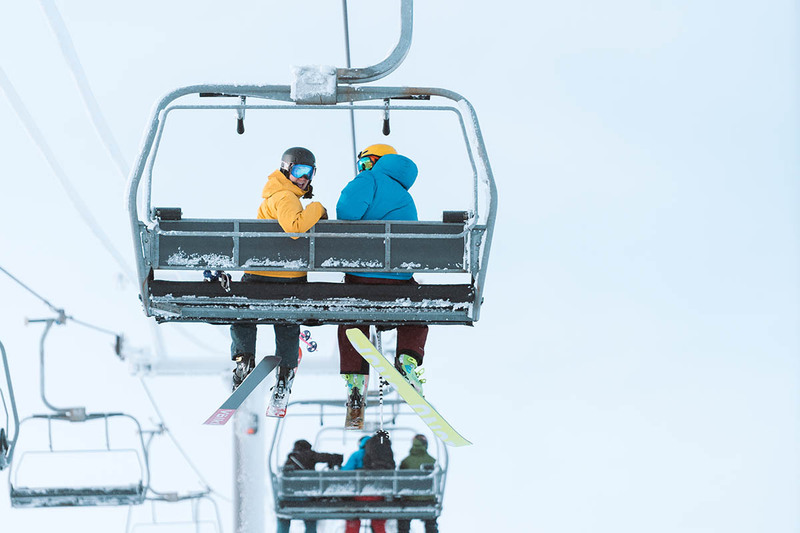 Below, we outline everything you need for resort skiing, including equipment essentials like skis and downhill boots, clothing items such as jackets and gloves, and optional extras you'll want to consider bringing along. For more information on each product category, many of the headings link to our detailed product round-ups. And for all of our recommendations in one place, see our ski gear reviews. Whether you’re carving up corduroy or venturing into the trees, it’s nice to have a quality pair of skis underfoot. When picking a downhill set-up, you’ll want to consider the type of terrain you plan to ski most and your ability level. Where you live is also a big factor: those on the East Coast trend towards a narrower ski for hardpack, while riders out West will want something that can stay afloat on a powder day. If we had to choose one ski, our top pick for within the ropes is the Nordica Enforcer 93: it has a solid edge, just the right amount of stiffness and flotation, and impressive performance at speed. And for those just getting into skiing, we also have a list of our favorite skis for beginners. No matter your ability level, a comfortable boot is an absolute necessity. A pair that fits well will inspire confidence on the slopes and promote all-day comfort, while an ill-fitting boot will be uncomfortable (at best) and significantly hinder performance. We highly recommend visiting your local ski shop or gear outfitter to try on boots and choose one that’s right for your foot shape and experience level. Make sure it’s downhill-specific (not a touring boot) so that it transfers power efficiently and is compatible with your alpine bindings. 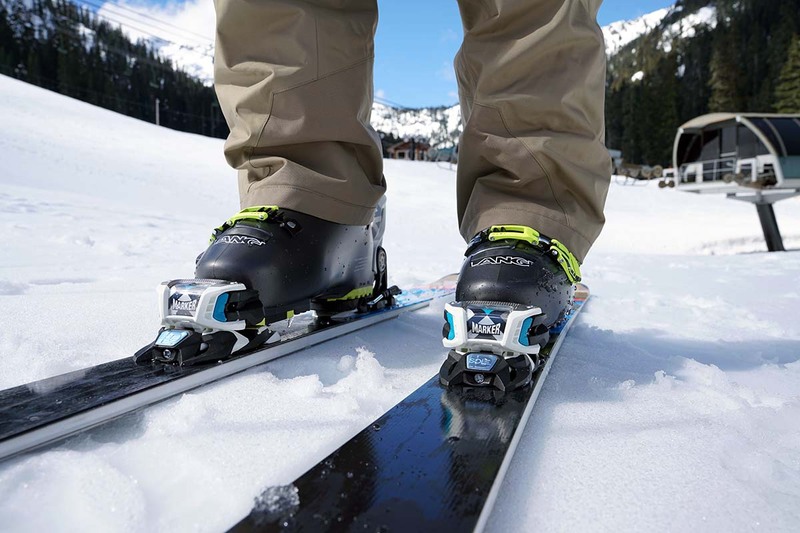 For intermediate skiers, the popular Salomon X Pro 100 is one of our favorite boots, with a high-quality build, plush liner, solid support, and smooth forward flex. The third piece of downhill equipment is the all-important ski binding. Alpine designs are pretty straightforward, and there are a number of solid options with proven track records. 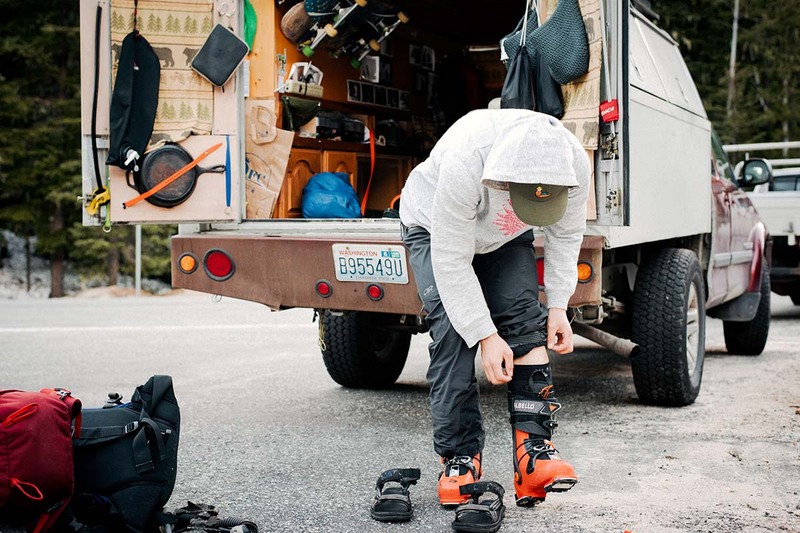 A binding’s DIN rating is one item you’ll want to nail down: lightweight, casual riders can get away with a lower DIN (approximately 8-11), while hard-chargers will want a higher number (12 and up). A good all-around option for all but the most serious skiers is the Marker Griffon, which is reliable, secure, and offers a predictable release in a crash. Downhill ski poles are a fairly simple piece of gear, but they play a helpful role in setting a rhythm for turns and propelling you along flat sections of trail. Designs range from lightweight and pricey carbon models to tough aluminum builds that can handle use and abuse off trail and in the terrain park. Our favorite everyday option for skiing in bounds is the Leki Stealth S, which hits the mark for resort-goers with its tough construction, ergonomic grips, replaceable baskets, and functional strap system. In terms of safety, a ski helmet is a required piece of gear at the resort. 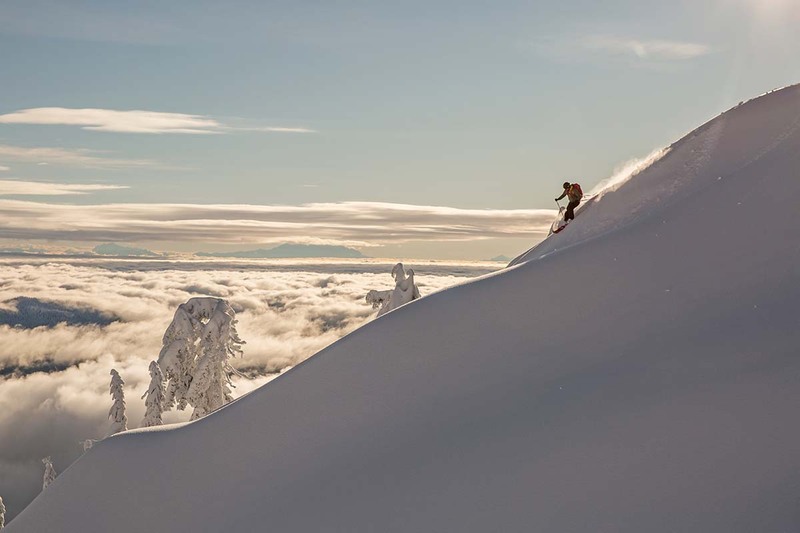 You’re more likely to ski aggressively in bounds (as opposed to the backcountry), while facing considerable risks like congested runs, other out-of-control skiers, and icy terrain. 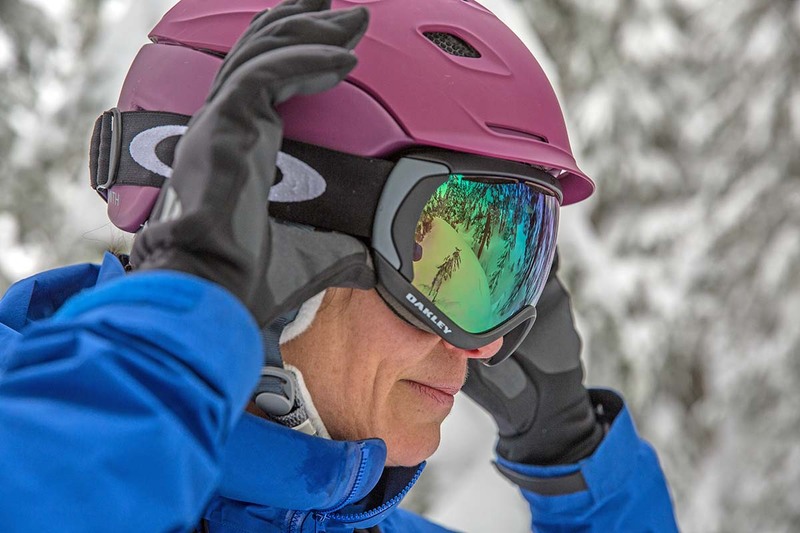 Recent advancements have made ski helmets lighter, safer, and more comfortable than ever. Plus, many—like the Smith Vantage MIPS—are feature-rich, with great ventilation and fit customization. If budget is what’s preventing you from protecting your noggin, you can score many well-equipped models for less than $100. Your goggles serve both as protection for your eyes from the elements and to provide a clear view of bumps, ice, and other potential hazards on the slopes. Lens quality has been a big emphasis in the market lately, with designs like Smith’s ChromaPop that enhance color and contrast. Another popular feature is interchangeable lenses, which allow you to opt for a darker lens for a sunny day or a lighter lens for better vision in overcast conditions. Models vary in how these lenses swap out, but we’ve found the magnetic system on Anon’s M3 MFI is the most convenient solution. Our top overall pick is the Smith I/O ChromaPop, which includes two high-clarity lenses and offers a range of sizes so you can dial in the perfect fit. Baselayers—or next-to-skin layers—function to keep the body warm while wicking sweat. Our favorite baselayers are made with luxurious-feeling merino wool, a material known for its ability to wick moisture and resist body odors. Furthermore, merino is adept at regulating temperature and keeps insulating when wet. On the other hand, synthetics (like polyester) are good budget-friendly options, but not quite as soft as merino and can really hold a stink. In terms of insulation, a midweight set is versatile enough for most days, but lightweight tops and bottoms can be nice in warm conditions. In the clothing layering trifecta—baselayer, midlayer, outer shell—the midlayer is the piece tasked with insulating the body’s warmth. As such, it’s the one article of clothing you’re most likely to swap out depending on conditions. If it’s cool and dry, we typically opt for the warmth and light weight of a down jacket. In slushy and warm conditions, we’d rather be wearing a fleece or synthetic jacket with more breathability and ability to insulate when wet. Our favorite overall pick is the synthetic Patagonia Nano-Air for its superior comfort and breathability, but for those brutally cold days at the resort, a down jacket will certainly be warmer. For your ski jacket, it’s best to look for a comfortable design that fits you well and offers high levels of durability and weatherproofness. The piece’s water and wind resistance is key during snowstorms or blustery days when drafts and moisture can be showstoppers. Options fall into three basic categories: uninsulated hardshell, insulated jacket, and budget-friendly 3-in-1, which includes a zip-in midlayer. All three are viable choices, but we prefer the versatility that comes with an uninsulated outer layer like Arc'teryx's premium Sabre. Similar to a ski jacket, a tough, water and windproof pant is a great choice for days spent in bounds. 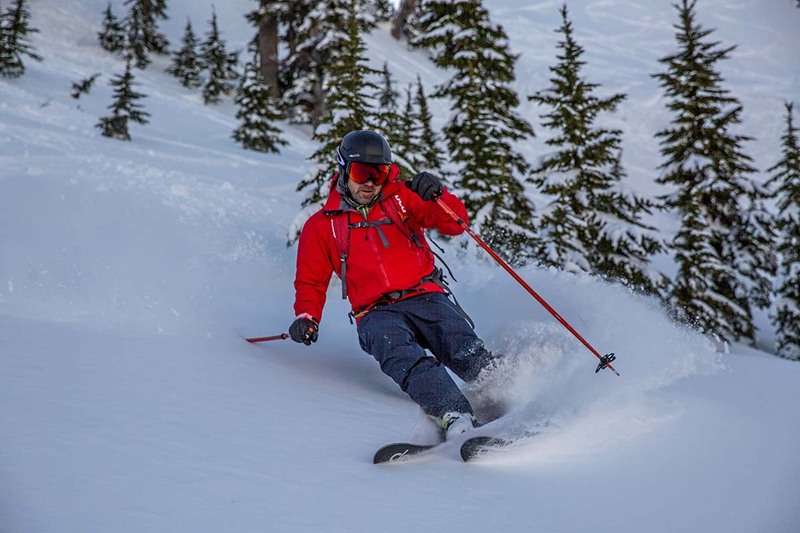 For those that ski consistently in frigid temperatures, it may be worth considering an insulated design, although we often prefer the flexibility of a thick, non-insulated hardshell for season-long use, paired with a light or midweight baselayer depending on conditions. The Arc'teryx Sabre Pant provides a great mix of waterproof and breathable softshell fabric with the extra coziness of a fleece backer. And if you want something a bit warmer, consider a bib: they provide better protection from the snow, wind, and precipitation, and also offer extra warmth by extending over part of the core. 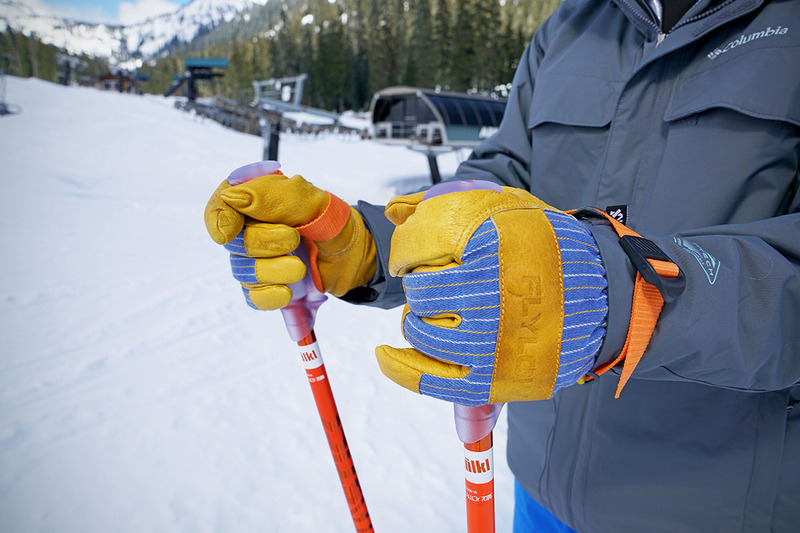 Because few things ruin a great ski day like cold fingers, it’s important to choose a quality glove that fits well and provides ample insulation. Mittens work well for those with poor circulation or chronically cold fingers, but we almost always use gloves for their superior dexterity. 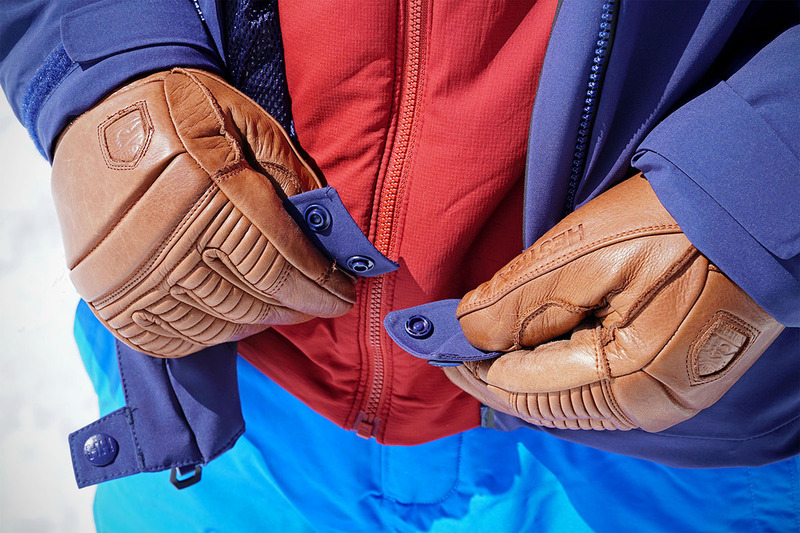 Our favorite gloves—like the Hestra Heli—are made with a tough exterior and generous insulation, and feature a gauntlet cuff for added protection from the elements. While a waterproof glove is not absolutely necessary at the resort, it doesn’t hurt—but keep in mind that many of these models (especially those made with leather) will need occasional maintenance to keep their water-wicking properties. A quality ski sock has a few important features: a close but not restricting fit, soft-touch materials that don’t itch, and enough cushioning to keep you on the slopes all day. They differ from everyday socks in their over-the-calf height and additional padding in rub- and pressure-prone areas—which is especially important when you’re wearing stiff ski boots. We like merino wool and wool blend socks like the Smartwool PhD Ski Light for their next-to-skin softness, but synthetic options—while not as stink resistant—will save you a few bucks. On especially frigid days when gloves just aren’t cutting it, cheap handwarmers are a secret weapon. All it takes is opening up a package and sliding a warmer inside to make the rest of the day feel bearable. We usually keep a few packages on hand for our friends too. HotHands makes air-activated, budget-friendly warmers that can be ordered online or purchased at most big-box retailers. There are a range of foot warmer options available, from heated insoles to battery-powered socks, but the best thing you can do to stay comfortable is choose a well-fitting boot. Modern ski boots offer impressive levels of insulation, so it’s just a matter of getting the fit right. In addition, you’ll need a sock that is thin enough to avoid cutting off circulation. That said, if you’ve exhausted your boot and sock options, companies like Hotronic and Therm-IC make great heated insoles and socks for cold-footed skiers. 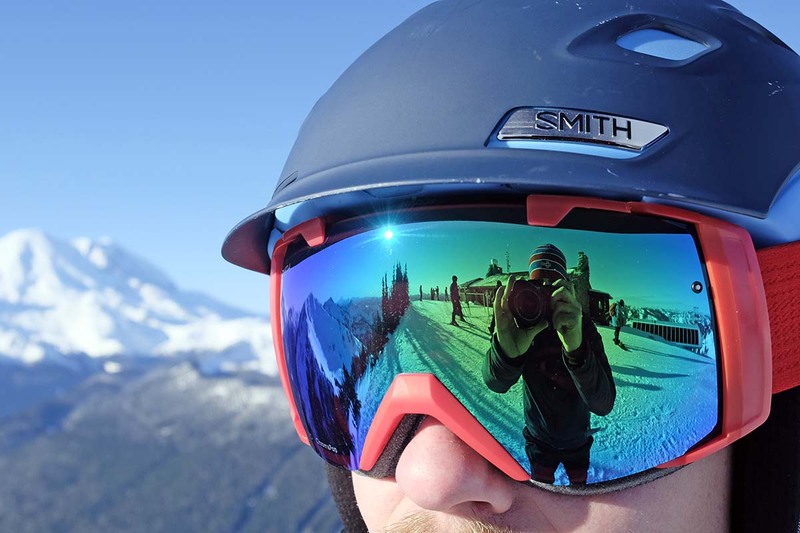 With limited pocket space, smartphones are the camera of choice for most resort skiers. A nice way to upgrade image quality is with a premium point-and-shoot like the Sony RX100 V, which is compact enough to store easily in a jacket. But if you take your photography seriously, there’s just no replacement for a professional-grade set-up. Mirrorless interchangeable-cameras help keep weight in check to a degree, and we’ve been very impressed with the performance of our Sony A7R III. For shooting video, GoPros are a great way to get a fun, first-person perspective, and their newly-released Hero7 Black has upgraded image stabilization to help smooth out shaky footage. Depending on the conditions or your tolerance for cold wind and snow, a balaclava or neck gaiter might be a necessity. Although ski jackets are often built with higher neck collars, these additional garments will extend up to or over your nose and provide an impressive amount of added warmth and protection against the elements. A balaclava is a more full-coverage option (covering your head as well), while a neck gaiter covers your neck, nose, and mouth. We’re as opposed to painfully over-priced snacks as you are—we’d much rather spend our hard-earned cash on après activities. Therefore, we always pack a few treats into our pockets when we know we’ll be at the resort all day. Great options include trail mix, bars, pretzels, dried fruit—pretty much anything that fits in your pocket if you want to avoid a trek back to the parking lot. Although our list above will get you through just about any day at the resort, there are a few smaller items that we often keep in our pocket or in the car. Some should definitely not be forgotten (like a ski pass), while others are just nice to have. Although ski gear and clothing is widely available online, we recommend heading to a ski shop to try things on, get advice from an expert, and support your local small business. If you live in a location that does not have a ski shop or would prefer to browse from the comfort of your couch, we have some favorite online sites too. 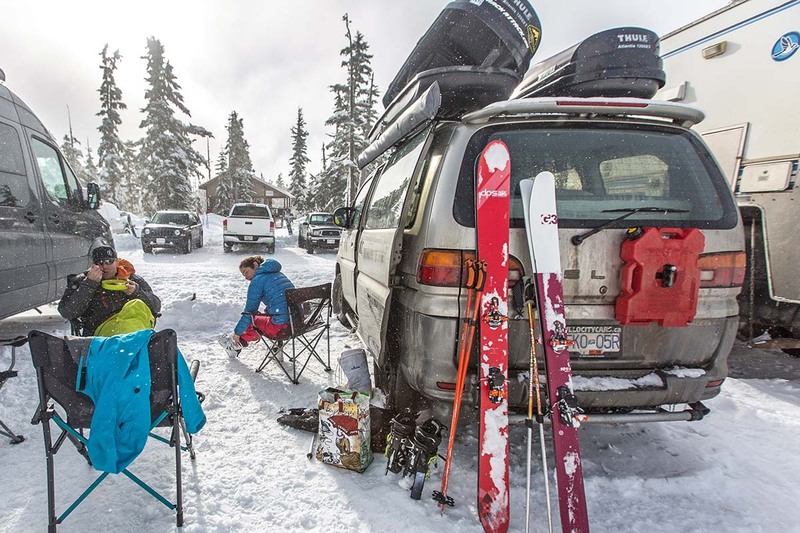 REI Co-op has a healthy selection of ski gear and ships nationwide for free on any online order over $50. If you can head to a store in person (there are more than 150), their staff are also typically very friendly and informative. We also love Evo.com for their ski specialization and helpful website. Last but not least, Backcountry.com has an impressive selection of winter gear, free two-day shipping on orders over $50, and great sales throughout the year.